Becoming a Montessori family has been life changing in so many ways, most obviously with the amount and type of materials we use in our home. Once you see why having so many toys is a problem, or when you make the decision to move towards Montessori, it can be completely overwhelming. But, taking a Montessori approach to purging your toys is possible! And, it doesn't exactly mean that you have to throw away everything you have and start over with only expensive wooden toys. 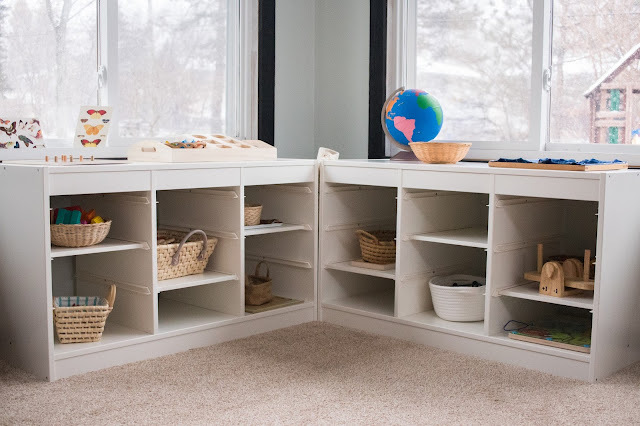 It will mean taking a hard look at what you have and whether it really fits with Montessori. 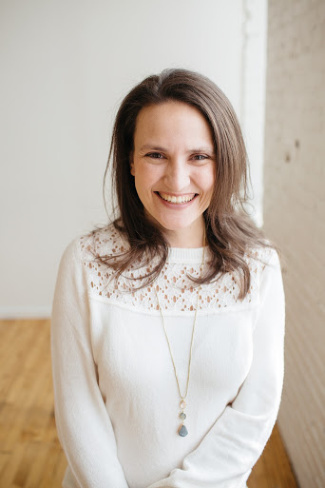 One note, however, Montessori is at its core about following your child's own path and respecting your child as a whole person. 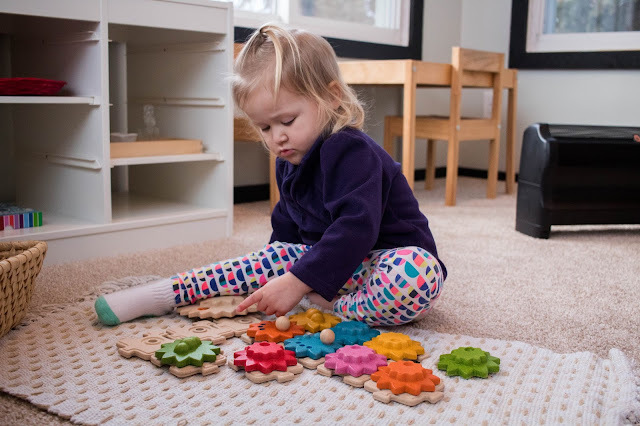 So, if your child has a toy, lovey, book, or whatever that your child super loves or is super attached to, but it doesn't fit Montessori ideals, don't take it away. Follow your child, that is more Montessori than whether or not you own some specific consumer product. First, remove all battery operated toys from your playroom. Battery operated toys are almost never compatible with Montessori, especially if your kids are under age 6. They just aren't. They aren't needed. They serve only to entertain, crush a child's concentration, and inhibit creativity. This one is really the most clear cut line and the easiest place to start. Second, gather all toys that have a similar or the same purpose. For example, do you need two types of ring stackers? Or 14 stuffed animals? Or 25 pretend cars? Nope. Here's a little harder example -- do you really need mega blocks, duplos, unit blocks and alphabet blocks? Maybe not. The specific examples and answers will depend on your family and what your children actually use and play with. What are their preferences? What best suits their needs? If both are about even, then I would keep the one that best fits with the other qualities listed here. One exception to this, puzzles. I tend to keep more puzzles than I need so I'm a hard judge here. But, I think its nice to have a small variety of puzzles on each level of difficulty to rotate through. 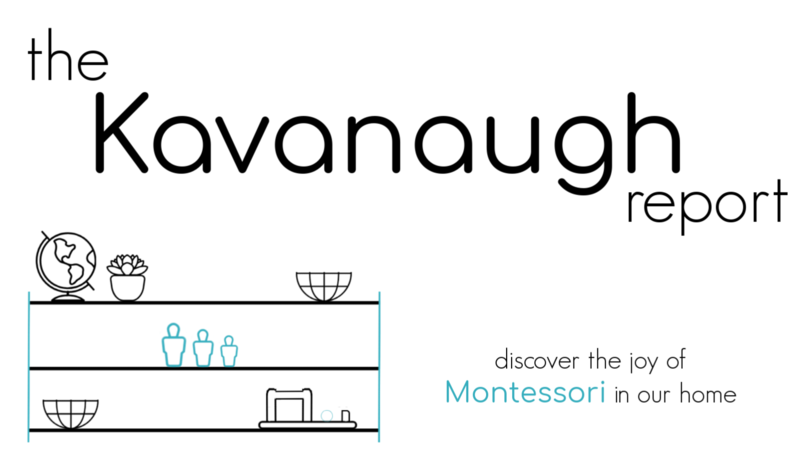 In Montessori, we want to provide children with real experiences as much as possible. Children, especially under 6-years-old, crave the concrete and want to focus on the world around them. This applies to school AND play. So the next thing to look for is all unrealistic toys and remove it all. This can include cartoons, characters, and fantasy based play. If you have duplicates -- let's say a plastic/metal toy car and a wooden car -- choose the most realistic one. Remove the others. This also includes some pretend play, specifically pretend play that has a real life counterpart. In other words, if your child can really clean, for example, there's no reason to have pretend cleaning tools. The play kitchen is probably the easiest example of this, but I know it's a hard one for many families to accept. While other pretend play, baby dolls for example, cannot be duplicated easily and therefore can be kept (although they should still fit into these other categories -- be realistic, without batteries, etc). Find all the toys that just aren't age appropriate any more and remove them. If your child has mastered the material, has outgrown it, or doesn't need it any more remove it. Also, remove things that are too advanced for your child. If your child is really struggling to use the material independently, try again later. This one is personally a hard one for me. I fall into the trap of "well, I think I saw her use that once last week, maybe, yes she must still need it, keep, keep, KEEP." No, do not be me. Also, MY BABY. I hate packing up the baby toys because it's a hard realization that my baby is not so baby any more. Finally, learning toys. Specifically this is a note for under 3's. In Montessori, we do not emphasize academics with toddlers. This means, no alphabet or numbers. So, if your child is under 3 and you have toys trying to "teach" them academic skills, remove those as well. There are a few things that you can prioritize keeping if you still feel like you have too much after you have gone through the list. I tend to say err on the side of having too little than having too much. Open ended materials are always great for children of all ages. 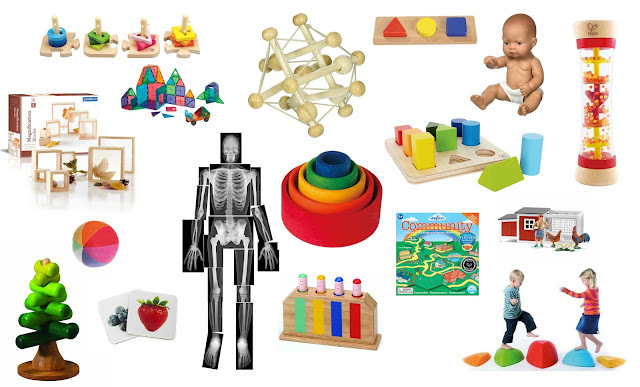 These include blocks, model animals, creative building materials, and art supplies. Natural materials are almost always preferred to plastic. 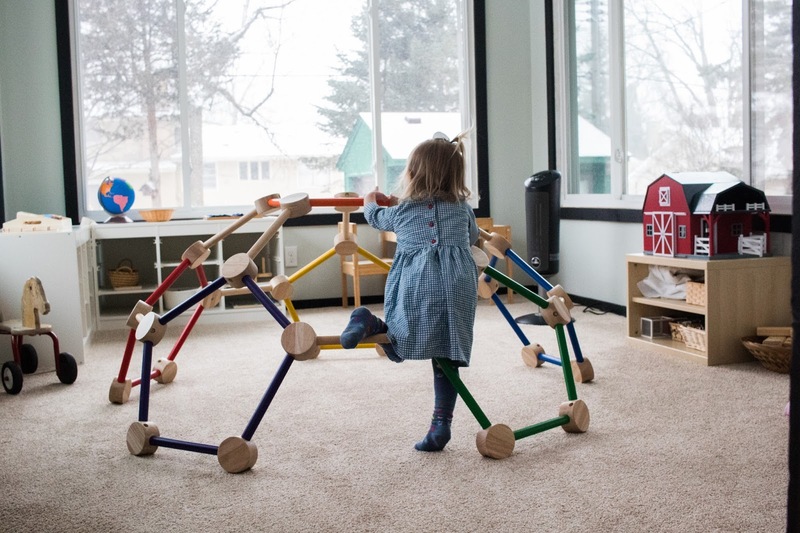 With the exception of baby containers (like exersaucers, swings and bouncy seats) that claim to help with gross motor skills, most gross motor toys are fine to keep. Bikes, trampolines, scooters, etc. are all great ways to get some wiggles out and keep kids moving. Once you have gone though all of your toys, you should have one pile to toss/donate/sell and one to (hopefully, much smaller) pile to keep. 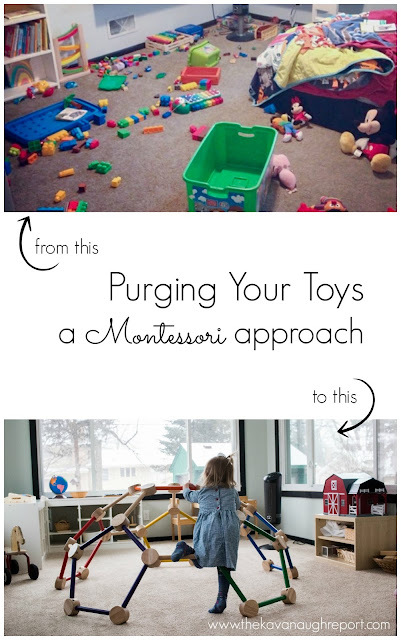 Even if everything doesn't fit perfectly with Montessori, even taking these basic steps can go a long way. Now, how do you organize the toys you kept?! Find Out Here! This article is so great and useful, Nicole, thanks! In our house, we also eliminated most of the "toys" that are marketing products (that included Disney, Dora, etc. for us). I consider those fantasy, cartoons and characters. So, we don't keep these things in our home. We do have a few star wars/superhero toys that have made their way in, but as a rule we don't buy it and keep it very limited. 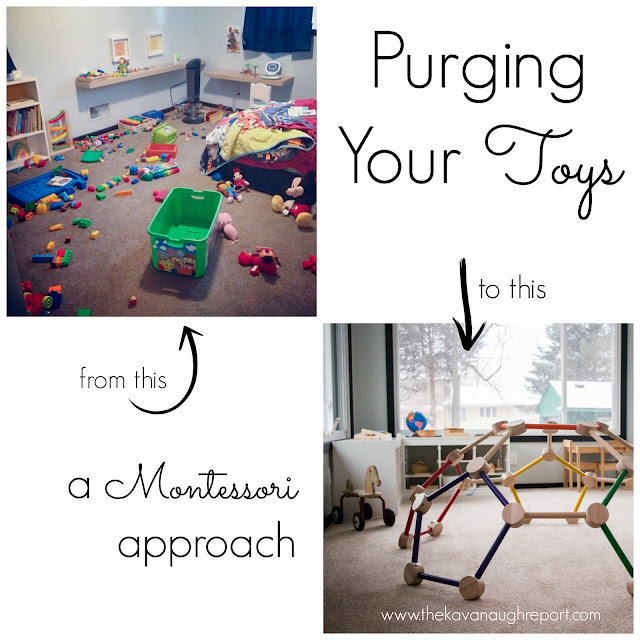 I purge my daycare playroom all the time, but you have def inspired me to do another purge- I LOVE rotating toys out so its not so cluttered- thank you for this post! And WHERE did you get that climbing dome?! It's AMAZING. THANK YOU! This is so helpful, I have started selling away and realize that even the things I have on his shelves now are not age appropriate/don't have a purpose. Great ideas! Where did you find your Montessori continent globe? I like how it has a traditional globe stand vs just sitting on a wood block/peg. Thank you. I would like to see what ypu have in your house not for shopping the same items but to get some more real life examples. Thank you! We have been purging toys but could still purge more. Here's a question: what do you do when other children come over to play? I think I would feel frustrated preparing a work/play environment for my child and then have a friend come over and pull everything out. What about play kitchen stuff to go along with playing with the baby dolls? Thanks for this article! I do have a question, my 4 yr old has about 20 stuffed dolls/animals that just sit on her bed. She doesn't play with them but when I ask if she's like to give some away, she wants to keep them all. I want to respect her wishes but I also want her room to have things in it that she actually plays with (and these haven't been touched in at least 2 weeks). What would you recommend? I am in love with your wooden goedome toy/climbing structure! Could you tell me what it is called? I made it using an old outdated globe I found at a thrift store! No play kitchen for us, we find that real experiences in the kitchen are honestly more interesting for them. And as far as other children, I'm pretty relaxed about it. I know that things will get messed up, but it's usually not that big of a deal to restore order since there isn't a ton in the environment! I would recommend setting a limit about the number available and then rotating them in and out. Hopefully over time she will start to really decide which are her favorites. And in the meantime, a smaller number might help her actually be able to use them instead of being overwhelmed with the pile. Hello, I agree we all drown under toys. We almost never biy them. It's gifts from family and friends. Now I feel it is unfair to get rid of toys without the kids' consent. I would be very upset if a relative went through my kitchenware without asking me. Kids are emotionnaly linked to these toys, even the baby toys. They just love them. Just like I loved mine and was very upset when they we are eventually lost (during my parents' divorce there were issues with moving). We do donate to a local orphanage twice a year. We make space before birthdays and Christmas. But it is difficult to do more. Last time my daughter said "mommy, it is just too difficult". So, sorry, even if I like emptyness, if we avoid duplicates and useless stuff in the whole house (even clothes, shoes...), Kids toys remain the exception. We try to limit what is coming in now, by convincing people to offer experience (cook a cake, go to the theatre together) rather than more things,we absolutely refuse to get rid of what our children love because of some principles. Thank you so much! I will try that! Thank you. our 4 yr old helps out in the kitchen on a daily basis. We have had a play kitchen but I've noticed that she doesn't really play with it anymore. It is a community play things kitchen so I've contemplated putting it in our kitchen to store some things for her next to her water station. I've taught preschool for many years but have not done a lot of reading on Montessori. I been interested in Montessori for awhile now though. Hi!! Thank you so much for such an interesting article. I'm wondering how this works for twins. I have twin boys and we have some duplicate stacking and ring toys as both boys like to play with them a lot. Just your idea of this. Thank you so much!! I'm in the process of SLOWLY purging and having some success, but with a 3yo and 7mo, I've found that my youngest is still yet to be old enough to use most that my eldest has finished with! But I'll get there eventually! On another note, do you mind me asking where you got your shelving woth the adjustable shelves from? They are great! Those are from IKEA -- trofast line. I would still only have one of each, this can help to teach patience and sharing. Just like in a classroom, you won't find repeats of materials. I totally respect that. With my older children they are involved in helping us. But, We don't promote an idea that it's healthy to be attached to things. Things are just things, so I don't find an attachment all that important to my children, but maybe they are young still. I love the toy gears but can't find them anywhere, where did you find them? I find that my kids are attached to very little but if asked directly they would chose to keep every little scrap of paper, stone and stick that came into our home. They have a "special" box for trinkets and things they treasure but otherwise everything else is fair game. I do 99% of the cleaning, tidying and organizing and so I do have veto over what stays especially if it is not longer being used. I don't really support collections or unreasonable attachment to "things" so maybe it is just that I have passed this attitude onto my children. We had to keep most of our house packed for 6 months over the course of two moves. I thought the kids would miss a lot but they asked for nothing and I was shocked at how little they cared about their toys when they weren't accessible. They played with each other and their imaginations and it was honestly a wonderful 6 months! I did not put out most of toys once we did move. I wouldn't be too worried about decluttering without the kids consent. I don't touch the things I know they love but otherwise they don't notice. We have barely any toys in our home. And, it has been a battle to keep it simple with grandparents. It took nearly 2 years for them to lay off a little. Let Xmas the gifted our lo with a home swedish wall for kids. Our lo loves the open ended physical play. Hi, do you know where the interlocking hexagon/pentagon structure comes from? Looks fantastic for creative and gross motor play. Thank you.